The idea of “Beaver Go” originated from the recent worldwide fever of the location based game “Pokemon Go” and Geocache. 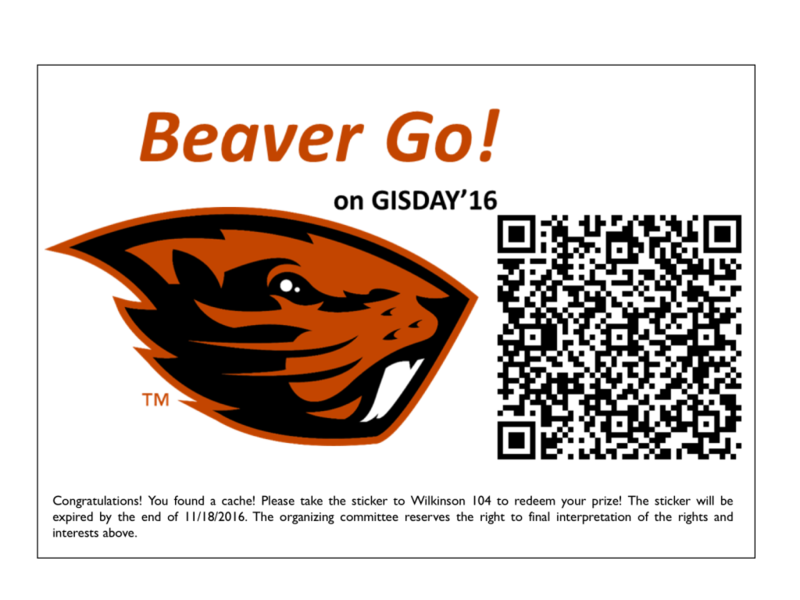 As one of the GIS DAY 2016 activities, “Beaver Go” invites OSU students all over campus to find 10 hidden stickers/caches. The locations of the stickers are listed as latitude and longitude coordinates on this web page. Or, pick up a handout from Wilkinson Hall lobby, Wilkinson 104, or the GAZE facility (Strand 361). This game will be held from noon to 4 pm on November 16. To find the hidden stickers, you need a navigation device (e.g., a mobile phone installed with google map, or a GPS receiver). By inputting the coordinates to the navigation device, you can locate the stickers. A player who finds a sticker will get a prize. Please peel off the sticker and take it to Wilkinson 104 to redeem the prize. This web page (http://blogs.oregonstate.edu/carto/beavgo/) will timely update the game progress, notifying the participants which sticker has already been found. Please keep an eye on this web page in case you are exhausted by looking for a found sticker. Enjoy GISDAY’16 and Go Beavs !!! This activity is organized by the Geography Program of College of Earth, Ocean, and Atmospheric Sciences (CEOAS), Oregon State University. The organizing committee reserves the right to final interpretation of the rights and interests above.